Ahhh summer. It’s hot outside and you want to wear a tank top without feeling exposed. I feel you, girlfriend. 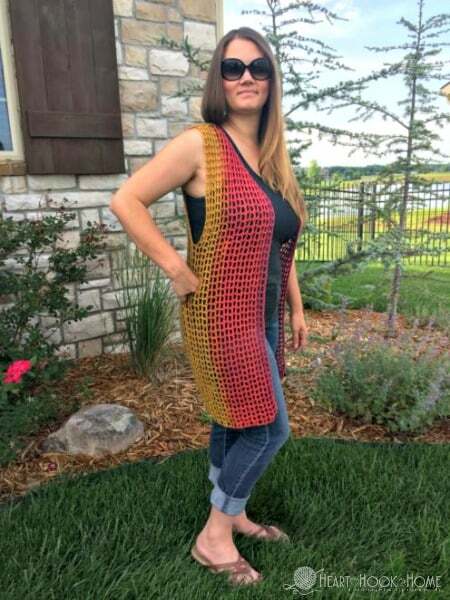 Which is why I created this NEW version of an Easy Breezy Lightweight Summer Vest Crochet Pattern! This is a variation of the Patriotic Vest with Fringe pattern. This lightweight vest is longer, it is wider, the front extends farther out and you can’t say “no” to those colors. 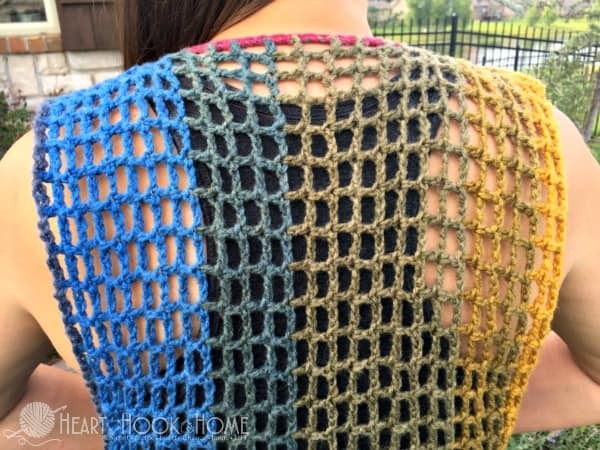 ♥ For this Easy Breezy Lightweight Summer Vest Crochet Pattern we use filet crochet. This means is that we are creating a crocheted “mesh” using the double crochet stitch and chain-2s. All double crochets will line up. We’ll leave the arm holes open, then add optional fringe and optional button or tie closure. I wear a size 10/12 and this airy vest is intended to be a one-size-fits-most adults (with notes to adjust for larger sizes). Should you need to adjust the sizing, simply keep adding rows as indicated until desired width is reached. If you would like the ad-free version of this pattern, you can grab that here on Ravlery for an itty bitty fee. Thank you! This is what I had left over from ONE Mandala as the pattern is written! • The chain-5 at the beginning of each row accounts for the first double crochet and chain-2. • To end a row, place the last dc into the third chain from the beginning of the previous row. • Each “block” is three stitches wide, consisting of a two chains and a double crochet. • Should you have any questions do not hesitate to shoot me an email or tag me in the Heart Hook Home Crochet Community group on Facebook. If you need help reading a pattern, start here. Note! If you would like the ad-free version of this pattern, you can grab that here on Ravlery for an itty bitty fee. Thank you! ***note! If making a larger size, simply continue adding rows until desired width is reached. Row 1: Ch-5, sk first ch-2 gap. * dc in top of next dc, ch-2 * repeat between * * 30 times, dc in top of next dc (32 blocks made) ch-54, join to third ch from very top corner with sl st. Turn. Row 2: Ch-5, sk 2 chs, dc in next * ch-2, sk 2 chs, dc in next * repeat between * * 16 times. dc in top of next dc, ch-2 * dc in top of next dc, ch-2 * repeat between * * to end. Dc in third ch from previous row’s beg ch. Turn. Rows 3 – 8: Ch-5, sk first ch-2 gap. * dc in top of next dc, ch-2 * repeat between * * to end. Dc in third ch from previous row’s beg ch. Turn. Row 9: Ch-5, sk first ch-2 gap, dc in top of next dc. * Ch-2, dc in top of next dc * repeat between * * 46 times (48 fully formed blocks) ch-2, sl st to top of next dc. Turn. Row 11: Ch-5, sk first ch-2 gap, dc in top of next dc. * Ch-2, dc in top of next dc * repeat between * * 44 times (46 fully formed blocks) ch-2, sl st to top of next dc. Turn. Row 13: Ch-5, sk first ch-2 gap. Dc in top of next dc * Ch-2, dc in top of next dc * repeat between * * 42 times (44 fully formed blocks) ch-2, sl st to top of next dc. Turn. Row 15: Ch-5, sk first ch-2 gap. Dc in top of next dc * Ch-2, dc in top of next dc * repeat between * * 40 times (42 fully formed blocks) ch-2, sl st to top of next dc. Turn. Row 3 – 8: Ch-5, sk first ch-2 gap. * dc in top of next dc, ch-2 * repeat between * * to end. Dc in third ch from previous row’s beg ch. Turn. ***same as before, if you would like the front to extend more toward the center of your chest, continue this row until number matches the other side of vest. Row 10: Ch-5, sk first ch-2 gap. * Ch-2, dc in top of next dc * repeat between * * 45 times (47 fully formed blocks) ch-2, sl st to top of next dc. Turn. Row 12: Ch-5, sk first ch-2 gap. * Ch-2, dc in top of next dc * repeat between * * 43 times (45 fully formed blocks) ch-2, sl st to top of next dc. Turn. Row 14: Ch-5, sk first ch-2 gap. * Ch-2, dc in top of next dc * repeat between * * 41 times (43 fully formed blocks) ch-2, sl st to top of next dc. Turn. Row 16: Ch-5, sk first ch-2 gap. * Ch-2, dc in top of next dc * repeat between * * 39 times (41 fully formed blocks) ch-2, sl st to top of next dc. Turn. Row 18: Ch-5, sk first ch-2 gap. * Ch-2, dc in top of next dc * repeat between * * 37 times (39 fully formed blocks) ch-2, sl st to top of next dc. Line up the front right to the back right and sew with tapestry needle along upper (shoulder) seam working from outside in. Repeat on left shoulder. Using the tail from the first vest front side, 2sc around the ch-2 spaces around the entire front opening of vest (including neck). Fasten off and weave in ends. Cut fringe pieces to about 7” long and attach in bundles of 2 strands every other dc post along entire bottom edge. Add a large/toggle button OR chain-50 (or as long as you want) and add as a tie closure. I did neither but you can do either (or both)! Voila! Isn’t it gorgeous? 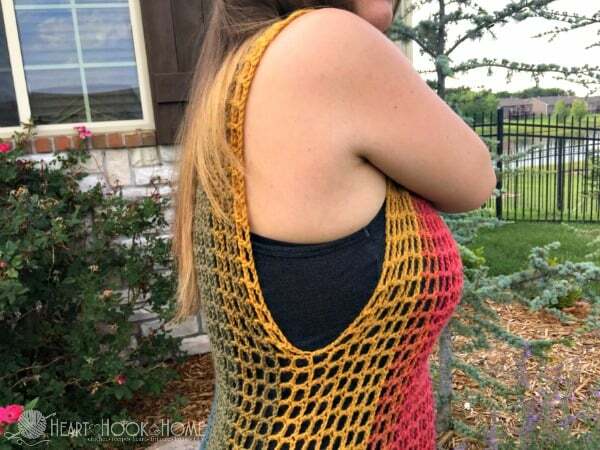 I hope you love this Easy Breezy Lightweight Summer Vest Crochet pattern as much as I do! 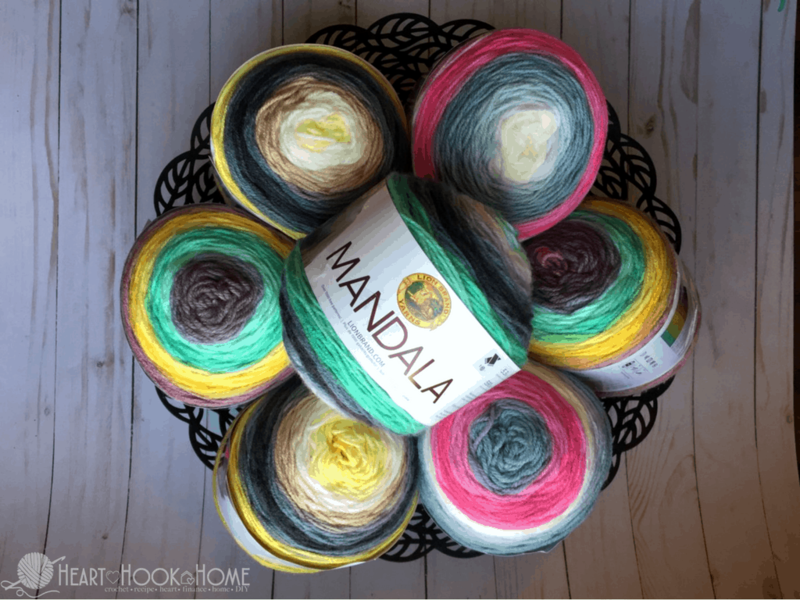 I love how it only takes ONE Mandala yarn cake by Lion Brand, which if you can find them at your Walmart are less than $5. Woohoo! Look at those color options! I'm stuck on the vest front. Do you have a video of this part? Thank you!! Hi Amber! Mandala is an acrylic yarn...I was indicating in parentheses that you could use any lightweight or 3 weight yarn in either cotton or acrylic as an alternative to mandala. Sorry for the confusion! Hi, Ashlea Thanks so much for this marvelous pattern. Do you have any recommendations on adding sleeves and perhaps a hood? Left you a message on YouTube for the pattern, I'm very good reading pattern am bit confused about the front panels and arm holes.... please look at your message on YouTube! Love your summer vest! Any chance there is a video tutorial out there somewhere for those of us that get stuck & need a visual? 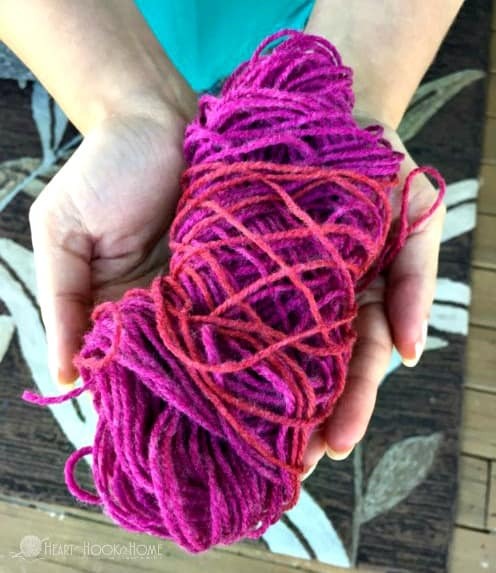 Would this work with sock yarn? If so, what adjustments need to be made? Thank you. Hi Adelle! You can absolutely try it with sock yarn. You will need to go down several hook sizes and increase your starting chain in multiples of three until you reach your desired vest length. Hope that helps! I love this pattern. Will size 3 cotton thread work or does it need to be yarn. I did not know if they are the same size since they have the same number. Hi Sandy! No, they are not the same. The cotton thread is significantly thinner. You can try it though...you will need to go down several hook sizes and increase your starting chain in multiples of three to your desired length. On row 2 of the first front of the best, after i make my 16 squares and the remaining stitches then turn I am confused. Do I just continue rows 3-8 making the 16 squares? Hi Aimee! Rows 3-8 will have 50 blocks. I’ve made a few of your patterns and I LOVE them they’re so simple and come out amazing!!! Just finished this Easy Breezy Vest!!! I’m wondering how I could make it shorter in length also if possible? Thanks so much!!!! Hi Audrey! I'm so glad you are enjoying my patterns! To make the vest shorter you just need to reduce the number of starting chains. The stitch pattern is in multiples of three, so say you want the vest 5 blocks shorter, then you would subtract 15 from your starting chain. Hope that helps! I need hto make this much smaller. About sze 4 or Small. How much should I decrease by? I am not experienced at making garments. Thank you. I just love this pattern. Hi Sue! Just like you would add rows for larger sizes, you can do fewer rows to make the width smaller. Hope that helps! This is just what I have been looking for, how can I make it shorter, how many chains would I start with, thank you, your pattern is so cute. Hey! I'm glad you like it. For each less block you want, subtract 3 chain stitches from your beginning chain. Hope that helps! It was pretty easy to follow. Thank you for all that you do!! You rock!! Made one for my sister in law for her birthday. 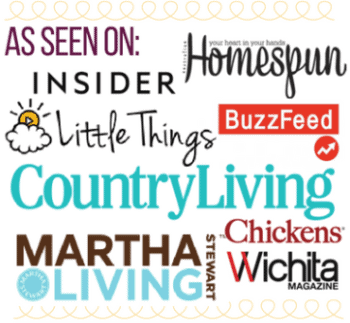 Keep up the great work and look forward to doing the cold shoulder top! I made this vest. Pattern was so easy to follow and it worked up in no time. I did have to add more rows but it wasn't even as issue. I posted the finished picture on facebook and was asked by several people to make one for them! Thank you for posting this pattern. Hi Ashley! I want to make this but I don't want it that long. How do I make it shorter? Hey Rachel! I can take photos and add them when I make my next one. Already on my hook! 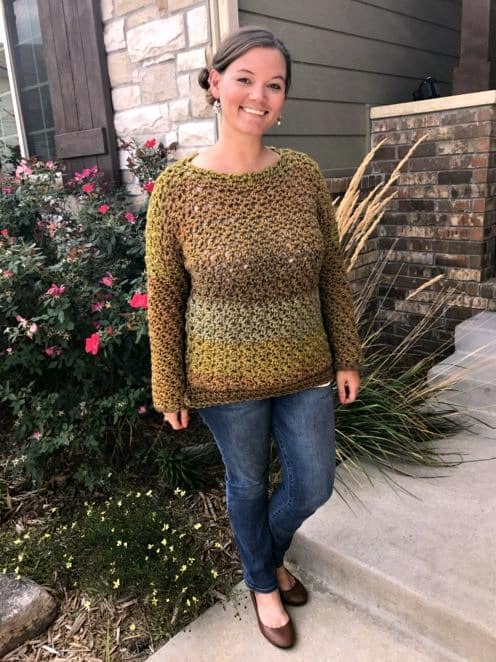 Thanks so much for the pattern! Quick question: I began making the vest and after the chain 155 for the adult size. It asks to D.C. in the 8th ch from the hook,etc. and then ch 2, skip 2 and D.C. to the end and there should be 50 blocks. My question is after that series on row 1 I ended up with 2 stitches left at the end. What do I do with the them? Should I skip one and just work a D.C. in the last stitch? I need help. I don't understand in row 1, where you sl stitch the chain 54. It says join to the third ch from very top corner. I'm not sure what top corner. Thanks. Ok so I don't have the Mandala brand (our Walmarts don't carry it) but I do have Caron cakes which is 383yds. Will this work? Also I'm kinda short so I was planning on not making it as long as yours. Should I try it and play yarn chicken and see who wins??? Do you Have A Video Shop ING How To Do The Front Of The vest? Not the front, just make sure that you're slip stitching instead of double crocheting after you do the last chain-2. I can help if needed! What size can you go up to on this? I wondered the same thing. Also is the first part of the pattern the back? 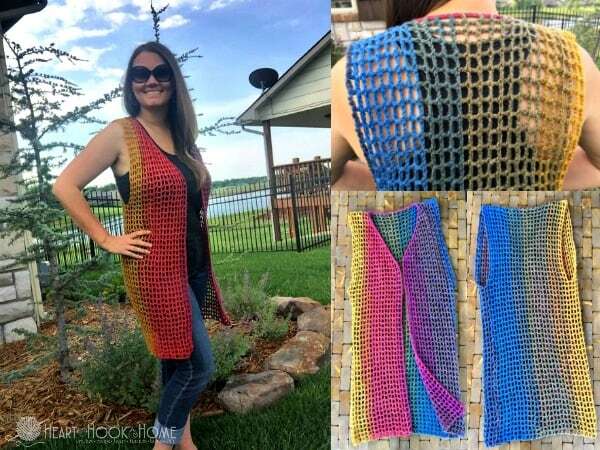 Yes the first part of the pattern is the back. Not being very fashion savvy, would this vest work with a t-shirt? I don't wear tanks but like the idea of a summer vest.